Spray irrigation of wastewater should not be confused with farm irrigation. Water can be purified either as it flows overland or as it percolates through the soil. Purification, in either case, occurs biologically and depends on the biota and organic litter on and in the soil. Pure sand, without organic debris, provides only mechanical filtration without reducing the soluble organic matter. Most spray irrigation systems rely on water percolating through the soil and flowing away from the irrigation area by an underground route. Ordinarily, this underground flow is natural drainage, but it can also be enhanced by artificial drainage. When hydrological characteristics limit the lateral movement of underground water, wastewater treatment facilities can substitute an overland flow technique. The grasses planted on the treatment field are multifunctional; they protect the soil surface from erosion and compaction and retard the flow of water across the slope in overland flow systems. They also provide a protective habitat for microorganisms and a vast surface area for adsorption, mass biological activity, and treatment of the impurities in the water. When the grass is cut for hay, it is a valuable crop that can effectively reclaim the plant nutrients released to the soil during decomposition of the organic waste material. Almost any species of grass is satisfactory provided that it produces abundantly, is water tolerant, and forms a turf. FIG. 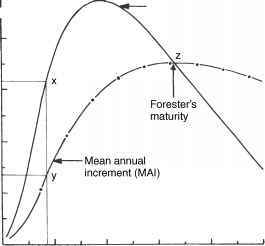 7.52.1 Population succession cycle. crobial populations in the disposal field, although specific for the plant effluent, comprise a highly complex community. 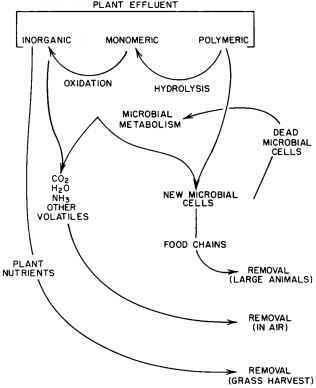 Organisms use the organic waste products from both carbohydrates and proteinaceous matter as nutrients. The carbon dioxide and water released by the degradation of carbohydrates escape into the air. The ammonia released upon decomposition of protein can be 1) released to the atmosphere, 2) used directly by microorganisms, and 3) converted into nitrite and nitrate. Microbial use of the organic effluent constituents converts a portion of this material into new forms of organic material that, if not removed, are used by different microbial populations. The process is repetitive, and a portion of the organic matter is converted into carbon dioxide, water, and ammonia at each cycle. Tests show an evolutionary or seeding process whereby microorganisms specific for an effluent develop on the disposal site. The time required for the evolutionary process may be one reason for the greater capacity of older disposal systems. Also, the maturing of the system may be hastened when it is seeded with specific organisms.